Hi Friends Demonoid is a website and BitTorrent tracker created by an anonymous Serbian known only by the pseudonym "Deimos" and "Zajson". The website indexes torrents uploaded by its members. It is the largest, and the most popular, public tracker, since The Pirate Bay tracker was shut down in November 2009. Demonoid.com was ranked the 502nd most popular website overall in December 2010, according to Alexa. 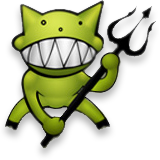 Demonoid's torrent tracker had an estimated 3 million peers in September 2007. The site had over 252,427 torrents indexed as of May 3, 2009 (torrents uploaded prior to August 4, 2005 were removed to free server resources).